It must not be easy to be Anna Netrebko. The hype surrounding her role debut as Anna Bolena last night was enormous, complete with absurdly priced scalped tickets and no fewer than three camera crews checking out the standing room line. Bless her heart, she delivered, and how! But the Wiener Staatsoper, the beneficiary of her fame and accomplice in all this hoopla, had the temerity to make her do all the work herself. Strong voices in the supporting roles failed to catch fire as Netrebko did, and Eric Génovèse’s life-suckingly dreary concert of a staging is something that any house in the world should be ashamed of. Donizetti, Anna Bolena. Wiener Staatsoper, 4/2/2011. New production premiere by Eric Génovèse, sets by Jacques Gabel and Claire Sternberg, costumes by Luisa Spinatelli, lights by Bertrand Couderc. 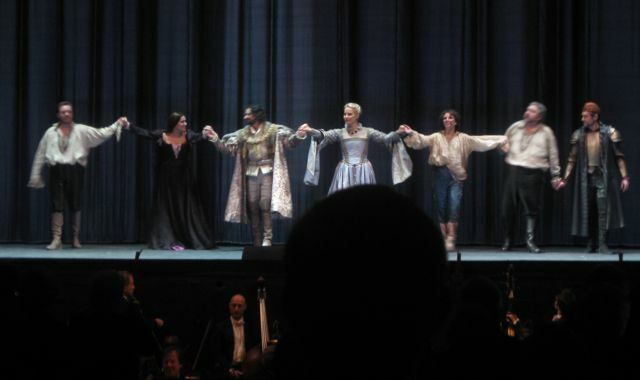 Conducted by Evelino Pidò with Anna Netrebko (Anna Bolena), Elina Garanca (Giovanni Seymour), Ildebrando D’Arcangelo (Enrico VIII), Francesco Meli (Percy), Elisabeth Kulman (Smeton). It’s hard to believe that this listless production is actually new. The static poses and stock gestures are straight out of your standard minimally rehearsed rep night. Actually, some of it is worse. What did they do for four weeks of rehearsal? And the drab visuals don’t help either. But let’s talk singing first, because that’s what this thing has going for it. But I think even diehard bel cantanistas would find rewards in her singing here, particularly her wide range of dynamics and gorgeously floated high notes. That plus dramatic intensity? Magic. The coloratura was mostly clean if not typewriter-mechanical and she showed a respectable if slightly unreliable trill and judicious use of chest voice. I can’t give you a rundown of acuti and cadenzas but she sang a good high D at the end of the first act and the cadenzas sounded like advanced level bel canto to me, not simplified. Sometimes her phrasing could be more immaculate, her sound a little more even, her coloratura clearer (her weakest point is descending scales). But slight imperfections are a small price to pay for her passion and commitment. I expect she will grow in the role with more experience and a stage director who is competent and can help her develop the character a little more, but she’s already very good, and a real star in an opera that requires one. By the way, I do not mean to set up a false dichotomy between bel canto with perfect technique and bel canto with passion. But that’s sort of how it turned out at this performance. Namely, if you prefer Elina Garanca’s Giovanna Seymour to Netrebko’s Bolena, you would be in the technique department of the School of Bel Canto Appreciation. I found Garanca a well-sung bore. The notes were all there, sung very cleanly and evenly with apparent enthusiasm, but her voice is too metallic and chilly for this repertoire. She lacks roundness, and sounded more like a soprano than a mezzo. She appeared to be doing the right things, musically and theatrically, but it was always that, an appearance, while Netrebko seemed to be living it. For all her considerable talent–she has a wonderful voice and is in all technical respects an extremely accomplished singer–she lacked any sign of personality or individuality. 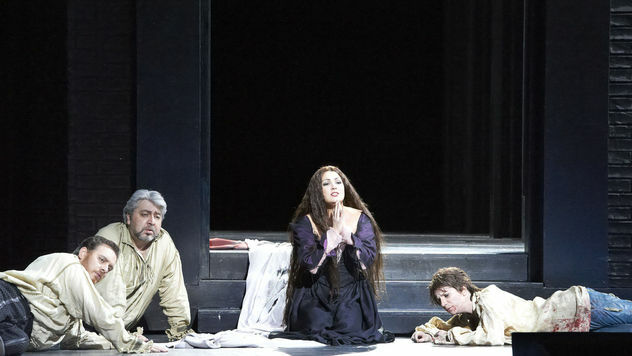 In pure decibels and accuracy she outsang Netrebko in the duet, but theatrically the scene did not ignite because the emotion seemed to be only on one side. Local favorite Elisabeth Kulman also does not have the most individual timbre, but in the pants role of Smeton her chocolatey tone and stylish phrasing impressed me more than Garanca. A former soprano, she also sometimes sounds sounds like a soprano with low notes, but the considerable range of the role offered her no difficulties from low to high. And she did much more with the text and got the straightforward intensity right. On the male side of things: As Percy, Francesco Meli gave an uneven performance. There were moments of liquid Italianate beauty in his singing, but they were mixed with too many ones of strained and wobbly tone above the passaggio, though he improved as the opera went on. He has a good idea of the style and tried to match Netrebko for passion (though he is a stiff actor), but the voice is coming apart a bit, I fear. As Enrico VIII Ildebrando D’Arcangelo was well cast and sang in a perfectly fine and correct way, but failed to impress me one way or another, which is probably more due to my general bel canto indifference than him (note that the picture below shows Giacomo Prestia as Enrico VIII, who sang the dress rehearsal). Evelino Pidò’s conducting was acceptable. The large-scale pacing was good, but sometimes it was inflexible and lacked nuance. The orchestra is notorious for not liking bel canto, but generally did a good job, with the exception of an overloud and sometimes ill-timed brass section. The trombones in the overture sounded like they were ushering us up to Valhalla, not through Donizetti. The chorus sounded very good, though their staging was awkward. Eric Génovèse’s production is frankly a disgrace, so static and dramatically ineffective as to drag some excellent singing into its mud. Not even the most basic actions have been taken to stage the drama, to an extent that drained energy from the entire evening. The set is a rotating room of flat black walls with many doors or windows that open and close with vertically sliding panels that resemble garage doors. Occasionally a cyclorama of trees in the background is revealed. The costumes are abstract period with reduced ornamentation, volume, and structure. The women are dressed mostly in metallic taffeta, which often gets rumpled, making them look like they are all wrapped in tinfoil, or in the curtains of a hotel with more money than taste. Netrebko wears a different dress in almost every scene, though, so there’s that. It looks unfinished, particularly the set, and gives no atmosphere whatsoever. No direction of the singers could be seen. Everyone stood stiffly in place, singing auf die Rampe, as they say here, the kind of dramatic downstage park and bark that should be reserved for a few dramatic solo moments or occasional big ensembles, but here was the only show in town. Occasionally they spin around dramatically, or wave their arms* and cover their faces with their hands (I didn’t always want to watch either). Netrebko visibly struggled against the static tableaux, swaying back and forth, leaning, and stretching her neck, attempting to do something, anything to establish a character. The lack of drama in the staging seemed to only magnify Garanca’s lack of engagement with the text, and she proclaimed to Enrico that she wanted love and renown as if she were asking him to pass the salt. The staging also failed to establish relationships between the characters, who often didn’t even look at each other at key moments. Oh, Anna does get to kiss Smeton, which could make sense, but here it really doesn’t. And there’s a cascading curtain effect that seems to be borrowed directly from last week’s Elektra, where it fit the music better. The only bit of creativity was at the very end, where Anna gets to hug her kid (Elizabeth I) and finally beheads herself with a big red robe and one of those descending garage doors. It’s not exactly a masterstroke of staging but rather better than anything else found in this reactionary sung concert. Far be it from me to suggest that they would have been better off with borrowing from The Tudors miniseries (on the record as an Anna Netrebko favorite! ), but, well, actually, no. I am going to suggest that. This production is dramatically moribund. Every bodice is left unripped. Something trashy and sleazy would have been infinitely preferable. Adultery and forbidden desire shouldn’t resemble an assembly of a mourning if shinier than average Puritans. Where’s the sexiness? You’ve got Anna Netrebko, for goodness’s sake. That’s a major opportunity, sexiness-wise. Needless to say, I am now quite looking forward to David McVicar’s production at the Met in the fall, which will also star Netrebko and Garanca. Should I send him some Tudors DVDs? No, I really don’t think he needs them. You can catch this Viennese production on ORF and Arte on Tuesday, April 5 at 7:00 p.m. Viennese time, and at various movie theaters. If you are in Vienna but can’t get a ticket, it will also be broadcast onto the big screen on the side of the Staatsoper at almost every performance. If you want to stand, be aware that the capacity of the Parterre standing room section has been considerably reduced by the presence of several giant video cameras. So you will have to arrive even earlier than the usual ridiculous times required by Netrebko appearances if you want a good spot. The cameras are located on the left side, so the right line may be a better idea. *This gesture seems to have a formula tied to the bel canto favorite IV-V-I harmonic progression: hand up (IV), out (V), and down (I, or in towards chest in case of a deceptive cadence). Photos copyright by Wiener Staatsoper/Pöhl? From Kurier, no credit given. Spot on review. Loved the drama in AN. Looking forward to The Met HD. Maybe I will try to watch some of the broadcast on Tuesday, I can always close my eyes. WONDERFUL REVIEW! THANKS VERY MUCH! Wonderful review, thanks! Can't wait for Anna's Anna to come to NY. I enjoyed your review very much and I certainly thank you for standing in line all day. "I am not a particular fan of bel canto singing as an abstract musical art, and what is described as wonderful I often find studious and emotionally detached." You apologize later for your false dichotomy but I think it was too late by that time. I find a great deal of emotionality in bel canto singing simply because when it is performed well, it is to me like an out of body experience; it provides that thrill of what a singer can actually do with his/her instrument, but if the singer doesn't feel that when performing and/or does it badly, then, not so thrilling and, really very boring, unless, you're Anna Netrebko. Anna Netrebko couldn't be boring if she tried. She has so many assets that this whole discussion of whether she is a bel canto singer or not is hardly the point. It doesn't matter as you so rightly outline in this lovely review. Great review! The various Netrebko quibbles you mention bothered me more, and dramatic honesty yes, but dramatic range I'm not sure about, despite the absence of direction. But I did warm to her much more than I expected. D'Arcangelo of course wasn't at the dress. I've never been overwhelmed but he is dependable enough. And at least you weren't lumbered with Prestia. Having read the papers this morning, I'm at a loss to say what is more lamentable: the production, or Wilhelm Sinkowicz's fatuous reaction to it. I paraphrase: "So yes, the production got booed. But period costumes are preferable to these opera directors who would stage a historical drama in a supermarket or garbage dump – where guards wouldn't be dressed in armour, but SS uniforms … Of course, nobody can explain how this makes a performance more compelling." Now quite a Viennese critical hat trick – my three qualifying criteria are self-certainty, sophistry, and parochialism – but his assertions are expressed so crudely he gets the prize anyway. As heard on ORF your description of the singing is quite superbly accurate and I would quibble only with the characterization Garanca's voice as "too metallic and chilly for this repertoire". The qualifier is important because I'm also not much of a bel canto cannoisseur but I wouldn't call her voice "metallic or chilly" in anything. While generally I like her a bit better than Trebs last night the latter had her for breakfast, lunch and dinner (which was also the case the one other time I heard them sing together). Thanks for the great review and the effort and time it took to get in there. *Speaking of Reggie it looks like I'll be following your footsteps a bit and seeing the Rusalka and Fidelio in Munich (as well as probably the disastrous Aida from a couple of years ago). great review! It was an incisive and utterly charming read. I agree with your prognosis of AN's performance (exactly what I heard through ROF) though I did really enjoy Elina's performance as well, but again I was only listening which is half the experience. I'm so glad you pointed out the awkward bit about AN kissing Smeton. I didn't get that at all. Why did she kiss "him"? Doesn't she get accused of cheating with Percy (because they were an item before she got married to Henry? Maybe I just didn't read the synopsis well enough. Ivy: Yeah me too! Anna N. plus McVicar should be fantastic. schmup53, what kind of music is thrilling is a tremendously personal thing. Most of the time I just don't get that feeling from abstract instrumental virtuosity in this music (which I find harmonically and melodically bland). You do. I still can't explain quite why I adore every measure of the objectively tiresome "Arabella." That's OK, it's taste! SS, oh lord, Sinkovicz. If he can't explain that he has no business teaching a course in "Modern Music Theater" at the Uni Wien this spring. Which he is doing. (!) Also, one thing you said in your dress rehearsal remarks is that Netrebko's final notes were not long enough. That was definitely not the case on Saturday night, so she probably was marking at least to some extent at the dress. marcillac, I don't know about Garanca, but there was some kind of vocal warmth missing, a problem I don't notice when she is singing in French. Would "silvery" be more suitable? And I'm not sure how to compare this to Figaro. The Figaro was a distressing failure of a production. This *wasn't* a production, it was a void. Seriously, I have no idea what they spent all that rehearsal time doing. I hope you like Rusalka and Fidelio. I suspect you won't like the Fidelio, I had mixed feelings myself but I prefer to err on the side of finding things interesting, it makes life more satisfying. Are you going to Harteros's Rosenkavalier as well? I am, but only at the Festspiele, don't have time to go to München earlier. Anon #7: Ha, yeah, I'm sorry if mentioning the kissing action was a non sequitur but it was one in the staging as well. It was in the final scene. In the opera text and everything up to that point in the staging, Smeton's love for Anna has been unrequited (Anna is married to Henry the Bass-Baritone and has been faithful to him despite her love for Percy the Tenor; Smeton the Mezzo is a Cherubino-type figure whose love for Anna is basically a plot device). And suddenly they kiss each other. It really didn't make any sense; there was no context. From the amount of nudging going on in standing room I suspect that it was the Male Gaze that made this bit happen, but I'm a cynic. Julia, it's OK. The worse the pun, the better. Yet again, a fantastic review Zerbinetta! Brava! The Fidelio is ausverkauft, I don't have tickets, I need 2 and while there's usually something at the office, occasionally free, that isn't always the case so there could be a problem. I'll try to find my way out of that particular labyrinth (speaking of bad puns) going forward. Yeah, I decided the best time for a Festspiele trip would be the last Rosenkavalier, the first Tristan, and the Jonas recital in between. I've already seen a fair amount of the other things and Lord help me but I don't get Messiaen. My tickets are limited view crap; I want your office's privileges! I think one of the Fidelios is their Oper für alle thing this year, so you could at least see it that way. Not anything near the same, I know, but Oper für alle actually is a lot of fun in its own way. Unfaithful, I think a lot of directors are under the mistaken notion that bel canto operas need no direction. Just put the singers out there with pretty costumes, and the applause will come. But a lot of bel canto operas actually have a lot of action, and are based on well-known historical figures, so when I see a totally blah production against moving black panels, I'm like, "Why???" The plot of Anna Bolena is very melodramatic, and there's a lot they could do with it. "No direction of the singers could be seen." I just never get tired of you ripping on the Staatsoper. Thanks for that gorgious review!! I have been standing there at the opening night, too, and my impression equals 99% of yours (except that I found the Seymour-Anna duet very emotional). You're absolutely right! I'm surprised by the lack of criticism on Mr. d'Arcangelo's singing. His performance really troubled me. Once a young bass-baritone with a beautiful voice and unlimited potential, it seems now that he's fallen into the classic bass trap. He attempted to make a sound too mature for him and he lost the natural beautiful color of his voice and was consistently singing out of tune. He barked most of the act ii trio and had to take numerous breaths finishing the famous "salira" section. Anyways, let's hope he gets back to bel canto. This Anna Bolena was everything just not belcanto!!!! Netrebko screamed and botom tones they are not existing ….where is music gone!!!???????? I wish that she think about music much much more …not just about her look what is so obviosly!!! 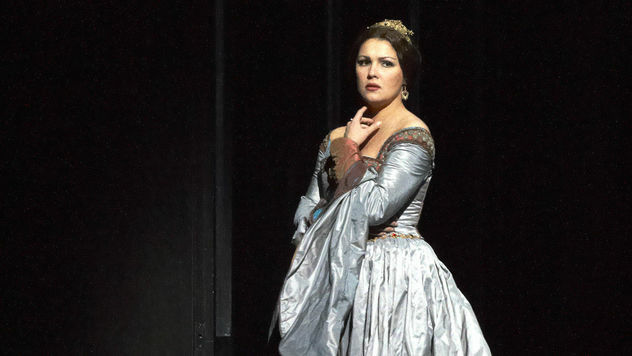 Netrebko gives pretty high notes in Anna Bolena but she is out of tune in the middle voice and has problems in the dramatic descending scales. Hopefully she will learn the role for her Met appearances but she is not any Maria Callas, not even any Montserrat Caballe. You must see the DVD of Anna Bolena with Joan sutherland to hear a "stupenda' soprano which Netrebko is not, Anna Netrebko does not even reach the knees of Sutherland ! I have heard Netrebko rehearsing at the MET. The sound is so generalized that the very fiber of Donizetti’s great melodies are unrecognizable given the formless treatment in the hands of the world’s diva. The tragedy is that for so many singers that do have a commitment to good singing, they simply don’t have the looks or beauty of tone. However, Netrebko has both, but is lacking the work ethic to simply sing better and in style. AND ASTONISHINGLY THE WORLD DOESN'T SEEM TO KNOW THE DIFFERENCE. If A.N. is the standard bearer, then we, the opera goers, have been fools to entrust this title unto unworthy hands. She has set the standard at a depth that would not have been unacceptable even in the 80s: complete disregard for rubato, the apparent belief that committed acting makes poor musicianship and unrefined technique permissible, and that the tradition of true bel canto singing is only the figment of fanciful historians' imaginations, not something worth bothering oneself with today. For the record, by this time in history, composers were using specific dynamic markings, trills and acuti for PURELY DRAMATIC PURPOSES, the days of improvisational cadenze had diminished. Netbreko's assumption is unspecific and tawdry in my opinion. Shame on the public for not demanding better. Foremost opera is music. There are still enough intelligent listeners of instrumental music to keep the common person from buying a beautiful sounding Stradivarius or Guarneri, learning the basics of bowing, and then having an international career as a star. This is what the public has done with Miss. Netrebko. WE HEAR NO MUSIC, just an opulent tone. No interpretation can exist if the music is presented to accommodate the unyielding and great limits of the performer. There will be, as there always is, a renaissance of fine singing and when this happens (something that I believe is happening already in academies), if Miss Netrebko is as important as this article posits, she should fear going down in history as the vandal that disfigured the faces of great works and got away with it. If she gets away with it. Check your Italian!!! It's 'Al dolce guidami ( castel natio)'. Not guardami!! Lead or guide me not look at me! Vergogna!